How often do you schedule oil changes for your car? Many people will tell you without batting an eye that you’re supposed to change the oil every 3,000 miles. While more advanced engines and synthetic oils mean many cars can go far longer than 3,000 miles between oil changes, it’s still a task you can’t skip altogether. Learn what happens inside the engine if you skip that all-important oil change. Then determine how often to bring your car to Scott’s Fort Collins Auto & Repair for an oil change. 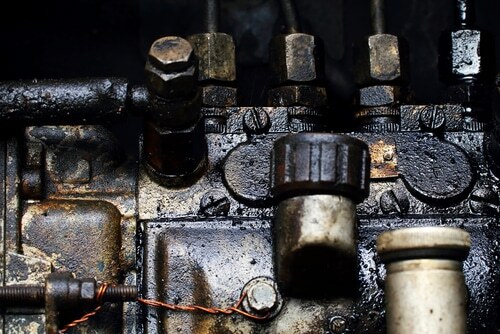 The purpose of oil is to provide lubrication and carry heat away from the engine. When your car runs, oil circulates past thousands of engine components that must work together to keep your car running. If they aren’t lubricated and cooled by oil, these components will grind against each other and create enough heat and friction to weld together, causing the engine to seize up. In short, running your car without oil will destroy the engine in a very short time. The oil filter becomes so clogged that oil must bypass the filter through a relief valve. This allows thick, abrasive oil to circulate through the engine, causing more wear on engine parts. Oil additives including detergents, rust-fighters, dispersants and friction reducers become less effective so the oil doesn’t lubricate as well as it should. The engine starts overheating, causing the car to run less efficiently and eventually warping and wearing out engine parts. The engine becomes damaged beyond repair and must be replaced. Usually, scrapping the car and buying a new one is more cost effective. The fact that dirty oil can ruin an engine is a scare tactic some mechanics use to convince you to change the oil more often than needed. However, the 3,000-mile recommendation is greatly outdated, what with astounding advancements in oil and engine technology in the past 30 years. Synthetic oils are largely to thank for leaving the 3,000-mile oil change recommendation in the dust. They’re more robust and able to protect engines from wear and heat for a longer period. Tighter tolerances (smaller gaps between engine parts) in modern cars also put less stress on engine oil. Check your vehicle’s service manual. Odds are the manufacturer recommends oil changes between 7,500 and 10,000 miles – or once a year, whichever comes first. Some Hyundai and Kia models with turbo engines recommend oil changes every 5,000 miles, as do some Toyota vehicles that use non-synthetic oil. Jaguars can last 15,000 miles between oil changes. When checking the service manual, follow the Maintenance Schedule for Normal Conditions. Only follow the Severe Conditions guidelines if you drive in freezing temperatures, extremely hot temperatures, stop-and-go conditions and mountainous terrain on a regular basis. Keep an eye on your vehicle’s oil life monitoring system, if it has one, which notifies you when an oil change is required based on your driving habits and road conditions. A majority of vehicles sold in the US since 2013 have this monitoring system. When it’s time to change the oil in your car, stop by Scott’s Fort Collins Auto & Repair. Our team of trained experts will have you in and out in no time. Schedule an appointment ahead of time or call us at (970) 682-4202 to let us know when you plan to stop by. We’re open 7:30 am to 5:30 pm, Monday through Friday.